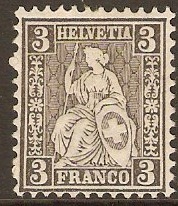 Switzerland 1862 3c black. SG53. 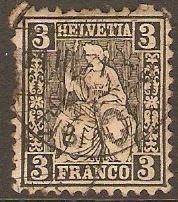 Used 1862 3c black. SG53. Mounted mint 1862 3c Black. SG53. 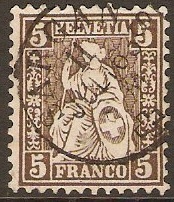 Switzerland 1862 5c brown. SG54. Used 1862 5c brown. SG54. 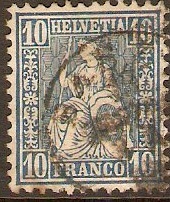 Switzerland 1862 10c blue. SG55. Used 1862 10c blue. SG55. 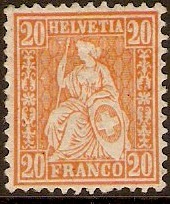 Switzerland 1862 20c Pale orange. SG56a. Very lightly mounted mint 1862 20c Pale orange. SG56a. 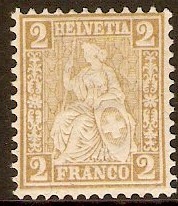 Switzerland 1867 2c light bistre-brown. SG61. Fine used 1867 2c light bistre-brown. SG61. 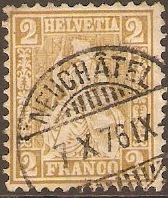 Unused 1867 2c Light bistre-brown. SG61. No gum. 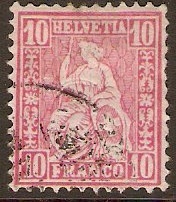 Switzerland 1867 10c pale rose. SG62a. Used 1867 10c pale rose. SG62a. 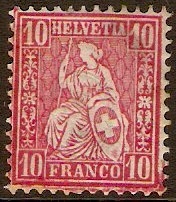 Switzerland 1867 10c rose . SG62. Some damage 1867 10c rose . SG62. Small abraded area on back of stamp. Sold as a space filler. 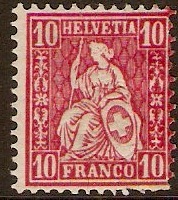 Switzerland 1867 10c Rose. SG62. Mounted mint 1867 10c Rose. SG62.